Barnet Market – where and when? 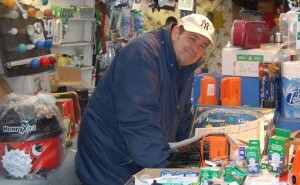 Andy Gardiner has been a trader at Barnet Market for 30 years. 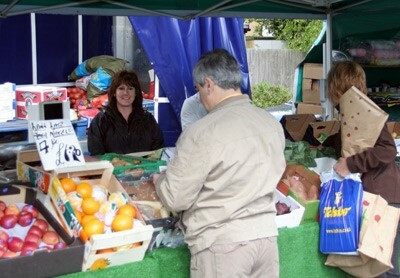 He is one of two fruit and veg traders in the Market offering a wide range of good quality, good value produce. Under certain circumstances, he can arrange to deliver. Dave and Tyler’s greengrocery stall always attracts a large crowd which often forms into a queue, evidence that the quality and value of the produce is well worth a short wait. 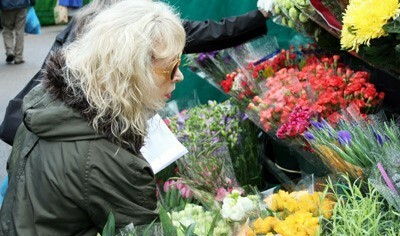 Next to Andy’s stall is the flower stall where you will find Charlie. There is always a lovely display of cut flowers and plants; very good value indeed. They also sell eggs so you can buy fresh farm eggs too. Lenny is a farmer who comes from the Chesunt area. He sells a range of poultry, game when in season, and meats of various kinds. He brings a good stock with him, but you can always order in advance for the following week. His home-made sausages, pork or venison, are delicious! Adi’s fish van is a very welcome presence in the Market, always with a smile on his face. As well as fish, you can buy Cromer crabs and various types of shellfish, all very fresh indeed. The selection of fish changes from week to week, but you are likely to find salmon (smoked and non smoked), tuna, swordfish, plaice, skate, mackerel, to mention but a few. These delicious pizzas are served from a vintage Citroen HY van and are the authentic Roman rectangular type of pizza. The dough is proofed for 48 hours in order to obtain a honey-combed appearance. The van can be found on the bandstand site on Fridays, Saturdays and Sundays from 12.00 noon until 9.30 pm. You can order for delivery on 07380 981380. We would like to pay tribute to some of the previous stallholders who have been part of Barnet Market for many years by including them in the following. They have contributed greatly to the character of the Market over the years. Rita and Alan had a loyal following for their prime, spanking fresh fish, sold at remarkably reasonable prices. Not surprisingly, their stall always had a waiting queue of shoppers who knew good fish when they saw it. It wasn’t just their fish which was a draw; it was Rita and Alan themselves, who always had a smile and a friendly greeting for their customers. Rita teasing Alan, with customers joining in happily, while she and Alan knowledgeably and skilfully prepared the fish – skinning, gutting, filleting with expert flicks of their knives. Steve ran a fruit and veg stall in Barnet market for about 30 years and was always incredibly cheerful and friendly. Latterly, he suffered from poor health which eventually led to him retiring. He has moved to Bakewell in Derbyshire where he is enjoying not having to get at a ridiculously early hour in the morning. Tony was a trader in Barnet Market for 12 years, a relatively short period of time, but he left many memories before his sad passing. He traded in electrical goods and components, and his stock was legendary. On the odd occasion that he could not supply what you wanted, he would go to enormous lengths to get it. He was very friendly and described by many as ‘a true gentleman’.